There was a detection of electric currents on the bottom of the ocean floor which was discovered a few years ago by researchers but they didn’t know at the time where it was coming from until now. Researchers from Denmark along with American researchers determined that the seafloor contains an array of “live wires” which may play an essential role in ocean ecology, if not the ecology of the whole biosphere! These “live wires” are built by bacterial colonies of “novel members of the deltaproteobacterial family Desulfobulbaceae” and is something that no researcher or anyone else for that matter have imagined that it even existed! In science daily, it tells about the reactions of researchers… “On the one hand, it is still very unreal and fantastic. On the other hand, it is also very tangible,” said Professor at Aarhus University, Lars Peter Nielsen. Another interesting thing discovered with these remarkable and well designed microbes is the fact they are 1/100 the diameter of the human hair and even being that small, they have an elaborate structure along with about 17 channels down their exteriors that match up from cell to cell, forming a continuous protective sheath, like insulation! If the bacteria were the size of humans, their signals would be traveling 12 miles long. The cables are not built for durability rather they break pretty easily, but these cables are alive and can regenerate and grow back themselves unlike man-made cables. Just a teaspoon of the ocean’s floor contains a half mile of these living cables. Moreover, the researchers found these in sediments from widely distributed samples, suggesting that much of the planet conducts electricity from the anoxic layer to the oxic layer. The electrical charge circuit is completed by ions in seawater, producing water in the process. This has led the researchers to speculate on their role in planetary ecology. Creativity is the idea while innovation is what brings the idea to life, are the researchers suggesting this was all about evolution’s idea? Also, the bacteria appears not only to exist for their own sakes, but they also exist to enable nutrient cycles that affect the whole biosphere! A question comes to mind, how would the first organisms survive without them? How did they form such elaborate structures? Evolutionists can’t just wave their hands up in the air and say they “evolved to” conduct electricity more effectively by transmitting electrons through their interiors, and then “evolved to” add insulating sheaths for “transmission improvement.” This discovery doesn’t help the story of evolution at all rather it increases its complexity to new heights. The idea of remarkable engineering in nature along with innovation comes from an intelligent mind, who created all things. We live in an amazing period of time where these discoveries are being made! Why must evolutionary scientists fit these bones in a vast period of time? It defies logic! Let’s look at its environment. Marine fossils happen to be buried in marine sediments – wet, and full of what? Microbes! Is it plausible that there was no decay for 70 million years? It makes no sense! Bioturbation would have occurred, along with degradation by microbes, long before the strata was uplifted into dry chalk inland in Belgium! Where is this evidence really pointing to? Well think about this, these bones are only a few thousand years old, buried rapidly under a load of sediment. Wouldn’t this explanation fit the data perfectly? Even though the original organic components remains controversial as did T-Rex when it was discovered with soft tissue back in 2005, the wrinkle becomes illogical, a whim of great faith in the story of evolution! But its quite an amazing discovery which fits perfectly in creationism! How Much Has The Oldest Shrimp Changed? They look identical, no evidence or indication that any evolutionary change has happened to this animal which is assumed to be 360 million years old. Yet, one scientist from Kent University suggests…“The fossil is a very important step in unraveling the evolution of decapods (the group in which shrimp, crabs and lobsters belong). However, more finds are necessary.” Really? How does a 360 million year old fossil retain muscles in it’s tail? 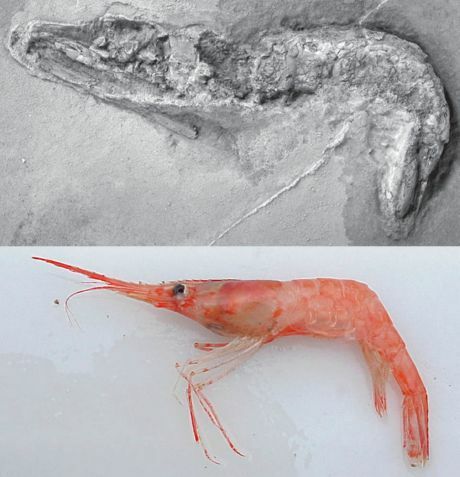 What event or mechanism could have buried this shrimp quick enough before micro-organisms broke down the body? By claiming a discovery like this one is an important step in understanding evolution is like finding a fully functional car with pistons, spark plugs, tail pipe, wheels, windows, already manufactured and looks like the cars of today which tells you nothing on how it supposedly advanced with a progressive slow process. It does indicate animals after their own kind (variants) like the Bible says. What’s really unraveling with this discovery is the story of evolution! The sudden appearance of complex major body parts in the fossil record during this period has surprised many evolutionists over the years. So researchers haven taken a sample of a genome from an animal that lives on the Great Barrier Reef. The paper also mentions the discovery moves complexity back in time and that the genome contains “analogues of genes that, in organisms with a neuromuscular system, code for muscle tissue and neurons.” This seems very strange considering a sponge doesn’t have a neuromuscular system nor does it have a central nervous system so why would a sponge have all those genes? This is not one calls good science but there is much imagination going on here. There is no evidence for such an ancestor only a claim there was one and no evidence for a mechanism by which genes having foresight would have emerged in single-celled creatures. All they claim is an a non-observational hypothetical that says complexity started with a genetic toolkit must have been present in a sponge ancestor. The Cambrian Explosion happened according to this paper is because of “quantitative rather than qualitative differences” in the tools. But does this really explain a trilobite, or a segmented worm, or animals like shellfish, crabs, the predator Anomalocaris, and all the other amazing creatures found at the point of the Cambrian explosion? And why would a microbe come up with these tools in the first place, even to produce a sponge? This hypothetical is some sort of mythical science fiction novel, not real science. The animal evolved “foresight” that it was able to come up with many complex innovations? The only thing that has “foresight” and also has innovations in complex situations is intelligence! What we are seeing here is an evolutionary story trying to explain away the highly complex designs made by God, and giving a mindless direction with a mechanism (known or unknown) the same ability as what intelligence can do which is not logical nor good science! Last year, one of the biggest surprises of 2008 in the field of biological evolution was the discovery of the combo jelly being the first animal. 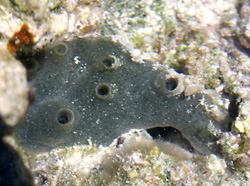 The simple sponge was previously believed among scientists to be the first animal. Now the combo jelly was a shocker because it’s way more complex than a sponge and generally evolution is suppose to go from simple to more complex. Researchers last year were so shocked by the discovery that they checked and rechecked their findings many times. After the cobwebs were cleared, the results remained the same. So speculation began to mount among evolutionary biologists, maybe the sponge lost some complexity (features like a nervous system). The difference in complexity from a simple sponge and a combo jelly includes tissues and a nervous system. Well this year we have a new species that has been deemed as the first animal in evolution. Drum roll please….This year’s winner is as scientists are narrowing it down to the ultimate champion…The amoeba-shaped creature called Placozoans. This latest discovery was made by the American Museum of Natural History scientists Rob DeSalle and Sergios-Orestis Kolokotronis. Also these researchers believe that even though certain nervous systems (referring to cnidarians and Bilateria) were made by the same molecules and using the same genes, it still might not be the same nervous system. If that’s the case, how could they ever tell the nervous systems apart so we know which is which? lol Some are suggesting that evolution produced the same exact nervous system not once but twice in different animals which is impossible, but then again these scientists believe anything is possible in evolution. Placozoans were previously believed to be the first animal even before this research study came out. The animal was deemed a very simple and small about 2mm in size with thousands of cells but only four cell types. A good candidate to be the first animal scientists believed. The simplicity of this unknown animal in the wild sorta hit a snag. It was found to have a common similarity with other animals except the sponge. This similarity is known as; epithelial cells which are connected by extracellular proteins. There is also an unknown factor in all of this and that is, Placozoans have never been observed in the wild. So scientists don’t even know where they live in their natural surroundings or how they behave in their natural surroundings but believe they might live under some rocks in the sea or something like that. Placozoans are only found in labs cultured by biologists around the world. The mystery of how certain marine animals like sea turtles and salmon which are able to locate their birthplace over long distances, have puzzled many scientists. I remember myself as a kid, watching a nature program about sea turtles. It was quite an amazing documentary. Salmon and Sea Turtles have an ability to detect the Earth’s magnetic field. They use the magnetic field in a way men from the distant past used the night sky to navigate their ships. The magnetic field guides them to the area in which they were born. Since the magnetic field changes, the turtles do not get the exact spot. On the other hand, Salmon use smell to locate their spawning area in parts per billion, and navigate through many miles with obstacles, to the exact spot where they were once hatched years ago. Quite an astounding feat if you ask me. It’s interesting how evolutionists are claiming the detection of natural selection gave these animals navigational abilities. The animals returned to their homes to reproduce is hardly an explanation, no I would say, it’s not an explanation at all on why the natal homing naturally evolved. The lingo is just another way of saying, “they don’t know.” This hypothesis is hardly a break through because there is no viable explanation on what mechanisms behind such abilities. In fact there is none of that sort of detail, only what “we casually see” in the wild is responsible. Something Darwin did when he was a naturalist. For example, we see the Salmon swim in freshwater, up the stream spending an enormous amounts of energy to the point where they just have enough energy left to spawn and then die. Questions surface when it comes to this process. There is a much more easier way for the Salmon to spawn. Wouldn’t it be easier to spawn in the ocean rather than freshwater. Why would natural selection if it was true, pick such a hard task for the Salmon when the advantage to spawn would be in the ocean? The explanations (including Geomagnetic Imprinting) using naturalism of this quite extraordinary phenomenon are useless, it did get them exposure in the scientific community, but lacked any substance in their hypothesis. Out of all the places where marine life once lived, to find them in tree sap located in a forest was quite surprising for French scientists who are evolutionists. The discovery contained in a November issue of Proceedings of the National Academy of Sciences called; Evidence for marine microfossils from amber. “Planktonic colonial centric diatoms were the most diverse marine inclusions in the investigated amber samples. Approximately 70 specimens have been confidently attributed to 9 genera. The most diverse representatives are elliptical frustules of the genus Hemiaulus, which are connected by long horns. Another scientific confirmation, the Bible is correct, and the skeptics are wrong! The marine life found in the amber which is the most unlikely place evolutionists expect to find them…Certainly a very interesting discovery!